One of the little things I do in addition to my full-time job is coordinate the marketing for a local barbershop called Cutters & Co. This basically means that I take the e-mail addresses the barbershop collects, enter them into Constant Contact, and send out a monthly e-newsletter. But then along came this company called Groupon, and I was intrigued. I loved the simplicity of the idea–one groupon a day, delivered by e-mail, always an amazing deal. I figured it reached thousands of St. Louisians every day–even if they didn’t buy the Groupon, they saw the e-mail in their inbox, which could help Cutters’ exposure. 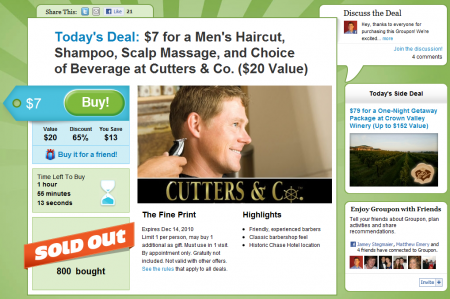 So I contacted Groupon and told them I wanted to put a Cutters deal on their site. This was a few months ago. Groupon called me back almost right away, but their approach surprised me and taught me a valuable lesson about business. When I talked to Mike at Groupon, he started asking me questions about Cutters as if he was choosing us as a client, not the other way around. He tried to determine if we provided a unique, cool service and if we were well reviewed on Yelp and Citysearch. I found myself wanting to prove to him that we were worthy of the Groupon. Think about this: By being selective about their clients, Groupon actually becomes more desirable (to the clients, to their customers, and probably to their investors too). The famous architect Frank Lloyd Wright did the same thing. He chose his customers. Many came to him asking for plans, and he chose a select few of them. In doing so, he improved the perception of his brand, and he was able to focus on the projects he was truly passionate about (although he took projects just to pay the bills at times as well). In the end, the Groupon was extremely successful–it was live this past weekend. Groupon sends their e-mail out to a mind-boggling 140,000 people in the St. Louis area. And they make good money–a minimum of $5/Groupon sold. Hopefully Cutters will wow all those new customers and hook them for return visits. Time will tell. Have you encountered businesses and services that were effectively selective? This entry was posted on Wednesday, June 16th, 2010 at 10:47 pm	and is filed under leadership and tagged with leadership. You can follow any responses to this entry through the RSS 2.0 feed. Actually, some online dating services came to my mind when I finished reading this. I know I know, it’s a far stretch from your topic, but hear me out. There’s been a few that have actually called me and interviewed me, looked at and judged my photos to see if I was pretty enough or smart enough to be on their websites. I was, but my friend for example wasn’t. I used to always think online dating services were there for the people, not all work like that apparently. Some pick and choose who they will allow on their sites. I’m not sure if it would be considered “effectively” selective, but it’s definitely selective. I didn’t know that dating sites did that same thing, but I like the concept a lot. Somehow I think it builds loyalty…surely you feel special that you got selected, right? So perhaps you might be more loyal to that site than other sites. Plus, you may be more comfortable with the men that site has to offer since they’ve been filtered too.